There's nothing like a relaxing journey by train, and Japan's extensive rail network offers travelers a wide range of scenic views framed by high & wide passenger compartment picture windows. Many tourists record the passing scenery on a smartphone so they can relive the experience at a later date... say, the next time they recharge their smartphone. 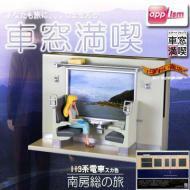 Introducing the Train Window Smartphone Charger Stand from Genius Cell! Just slide a compatible smartphone (iPhone 3GS/4/4S, Galaxy S/S II, or Xperia Arc) into the slot behind the Train Window Smartphone Charger Stand's window – the smartphone's screen will be the only part of the device visible from the other side. 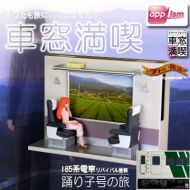 Replay your travel video, plug in the charger cord, and enjoy a miniature rail journey in the company of your miniature lady friend... wait, what?? That's right, a charming female figurine primly occupies one of the compartment's seats. Designed in anime style and daintily clutching a handbag on her lap, the figurine is positioned so that she appears to look out the window, lost in remembrances of old loves and hopeful of new adventures at her next destination. The Train Window Smartphone Charger Stand is available in three different designs inspired by real Japanese passenger trains. From above left: the Oigawa Train Oga 35 Series with blond figurine, the 113 Series train with brunette figurine, and the Odoriko 185 Series with red-headed figurine. 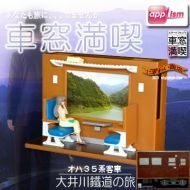 The Train Window Smartphone Charger Stand measures 14 x 10.1 x 6.5 cm () and is priced at $25 each at the Genius Cell website. 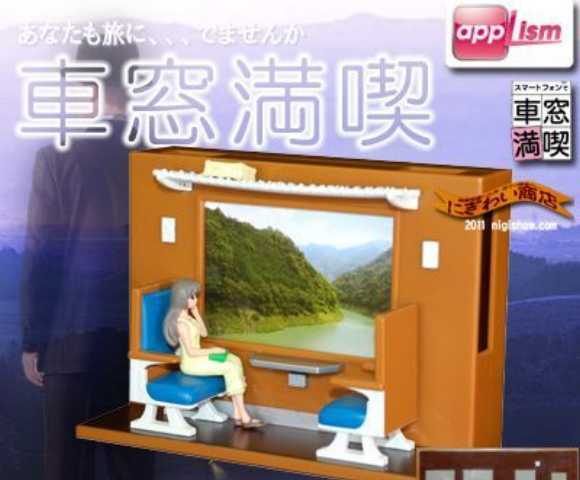 Smartphones and playback videos are not included, needless to say, nor is there any guarantee the train trip you record will be highlighted by a flying cat (as seen on the product page) who vaporizes cars with heat-ray vision... but in Japan, one never can tell. Want to Own the Most Powerful Action Figure Ever Made??? ?